The Yavuz Sultan Selim Bridge (sometimes referred to as the Third Bridge) spans the Bosphorus Strait in Istanbul, Turkey. 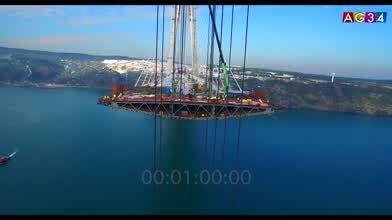 Opened in 2016, the 2.1k meter (7.1k ft) cable stayed suspension bridge is larger than the Bosphorus Bridge and Fatih Sultan Mehmet Bridges which lie to its south. In this remarkable video, contributor Omer Gokcen was able to use a drone to show the construction of the bridge over the waterway at the crossroads between Europe and Asia.